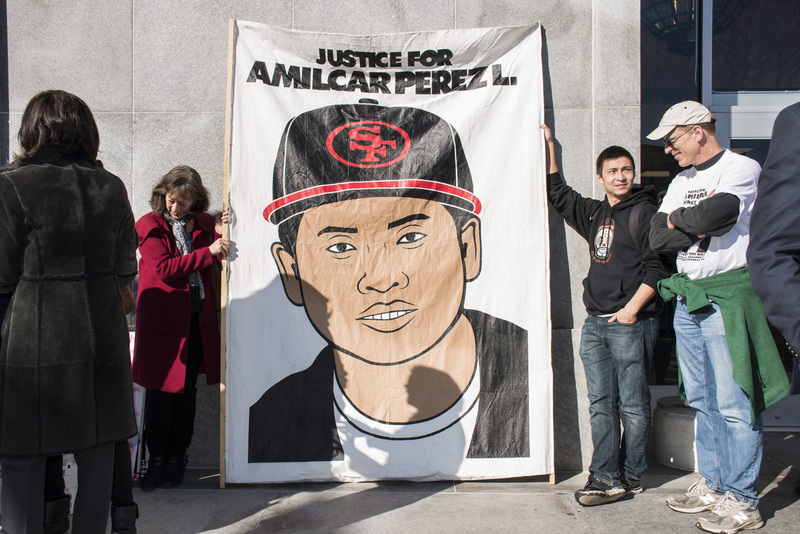 Public Defender Jeff Adachi stood alongside family and friends of police shooting victims at the Hall of Justice Thursday as they hoisted banners of Amilcar Perez Lopez, a 21-year old Mission District resident who was shot and killed by police on February 26, 2015. 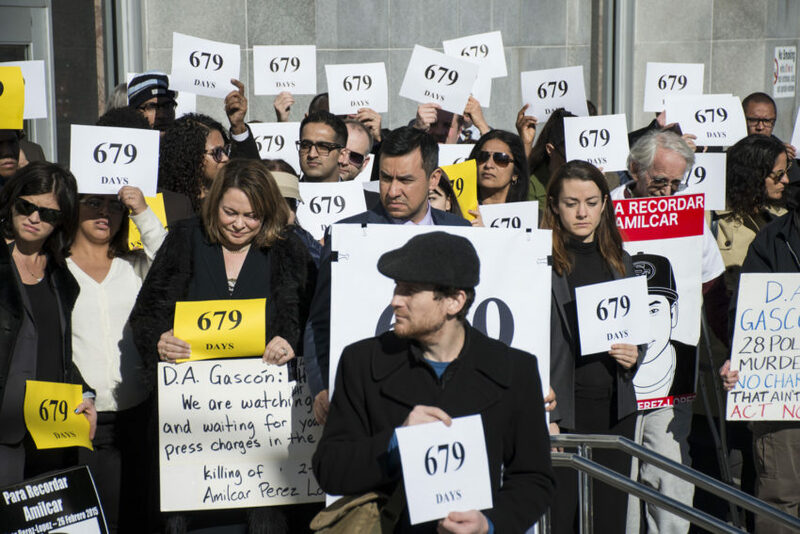 Activists in the Justice for Amilcar Coalition have repeatedly asked for charges to be filed against officers in police shootings, and activists Thursday demanded that District Attorney George Gascón conclude an ongoing investigation and charge the officers who shot Perez Lopez nearly two years ago. 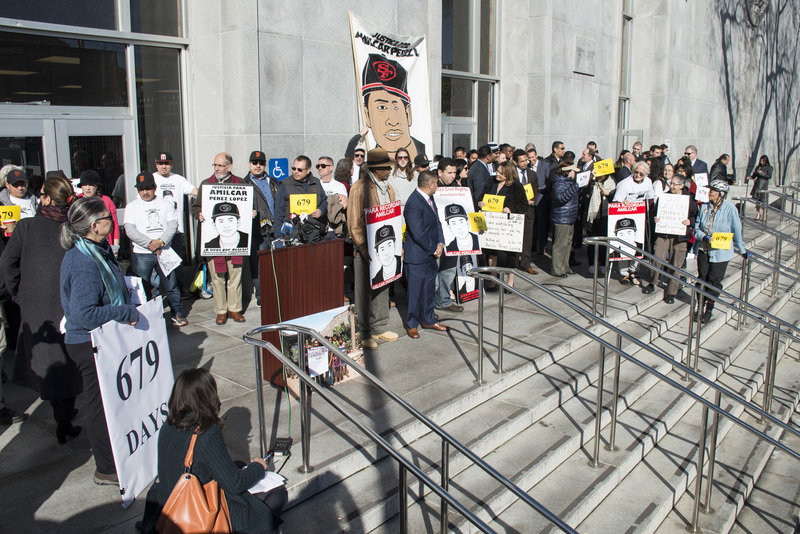 “We’ve been promised accountability by the District Attorney, by the Police Commission and so many others, yet we have failed to see that materialize,” Adachi said from a podium on the Hall of Justice steps. In February 2015, plainclothes officers Craig Tiffe and Eric Reboli say they were responding to a bike theft when Perez Lopez allegedly lunged at them with a knife. Autopsies later showed, however, that he was shot in the back six times, suggesting he was running away when shot and not lunging towards officers. After the autopsy results were released, former Police Chief Suhr told the press that Perez Lopez had been shot in the back as he turned around to attack the cyclist. 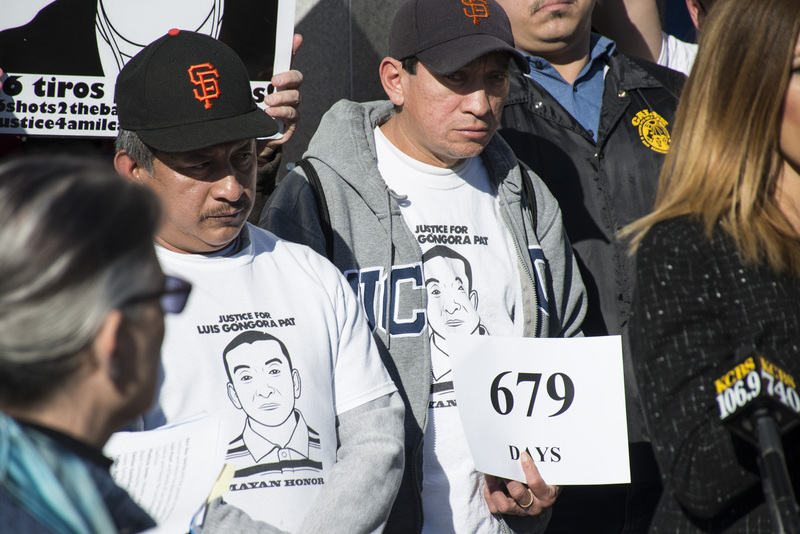 Adachi and activists stressed that 679 days had passed since Perez Lopez died, saying a criminal prosecution was long overdue. It is unclear why it has taken police so long to conclude their investigation. “This is a situation that we cannot afford to forget, because that’s what they’re hoping — that this will be forgotten about,” he said. The rally included support for the families of Mario Woods, 26, and Luis Gongora, 45, who were both shot and killed by police in 2015. The District Attorney is in the process of investigating 15 police shooting incidents. On Wednesday night, the day before the rally, the police presented a report on these incidents to the Police Commission. 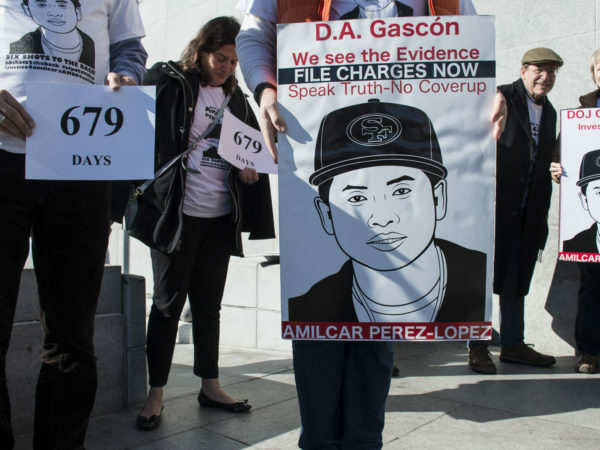 Activists have in the past taken issue with police handling of Perez Lopez’s death, saying it was unethical that Gascon’s staff arrived at the scene after Perez Lopez’ body was moved by the medical examiner. On Wednesday, police announced that the department has begun using a new communication system called the Everbridge Mass Notification System, which will automatically text, email, and call a list of 65 city contacts, including the District Attorney, in the case of any police shooting. The previous system required assigned police officers to manually contact each individual, resulting in potential lag time between the notification of police and district attorney contacts. Correction: An earlier version of this article misstated the number of days since the Amilcar Perez Lopez shooting and the date of the shooting. It has been 679 days, not 649, and the shooting took place on February 26, 2015, not February 29. 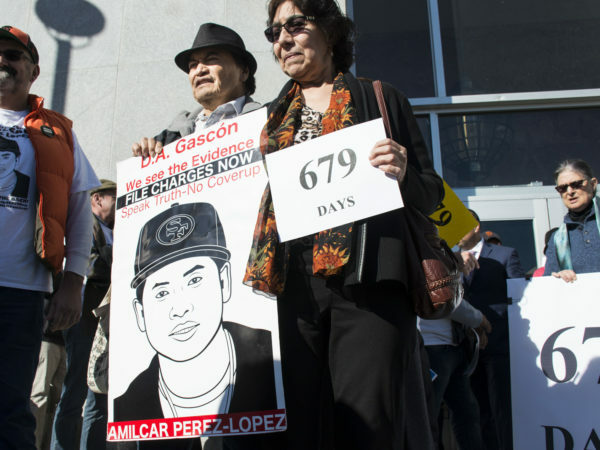 I find Gascon to be a lousy and corrupt public officials on many levels, including his refusal to indict cops who kill. What the hell is he doing swearing in Hillary Ronen as the Mission’s new Supervisor? Ok, he’s swearing her in on Sunday along with Jeff Adachi but his presence at the event doesn’t preclude asking Ronen what the eff she’s thinking with Gascon participating in an official capacity as she starts her Supervisor tenure.